Craftster Community > CLOTHING > Clothing: Completed Projects: General (Moderator: meleriffic) > My Babydoll Dress!!! Now with TUTORIALNESS! My Babydoll Dress!!! Now with TUTORIALNESS! The sleeves are a bit weird I just kindof made it up as I went along thanks for looking! My instructions may be weird... please let me know if they don't make sense anywhere. 1. Fold fabric in half and measure and cut out the pieces. 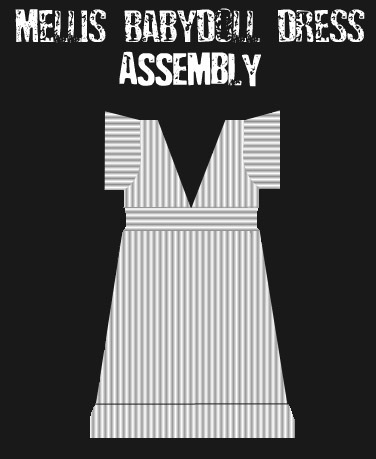 Remember to take note of the direction of stripes or pattern of fabric! You should have 14 pieces in total! 2. Hem the long uncurved edges of the front and back top parts. 3. Gather the front top parts on the yellow line. 4. Attach the two front top parts to one waistband piece, making sure the long uncurved edges meet in the centre with no gap, and the short straight edge matches up with the waistband edge. 5. Attach the two back top parts to the other waistband piece, also making sure they align. 6. Put the waistband and top part pieces together right sides facing, and sew up the straight outer edges, stopping at the beginning of the sleeve hole. 7. Sew the two skirt pieces right sides together down the lengthwise edges. Gather the top edge and make sure its circumference is your waist measurement. 8. Attach the gathered skirt edge to the bottom of the waistband. 9. 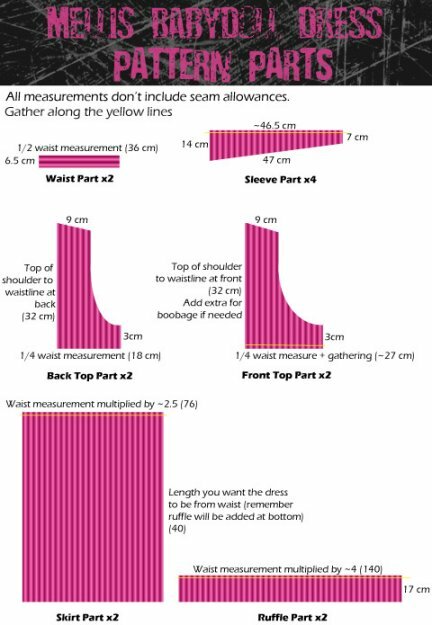 Remember if your fabric isn't stretch, you will need to insert a 18 or 20cm dress or invisible zipper in the side seam just under the sleeve hole. You'll probably need to unpick and fiddle with the seam a bit to get it in. 10. Turn the dress inside out and sew together the shoulder parts. 11. Take two sleeve pieces and sew right sides together along the two short edges. Do this with the other two sleeve pieces as well. 12. Hem around the outer edge of the sleeve (the angled edge). 13. Pin and attach the sleeves to the arm holes in the dress, adding around 4 large-ish pleats at the top shoulder part so it fits well in the sleeve hole. Do this with the other sleeve as well. 14. Sew the ruffle pieces together along the short edges, hem the bottom edge and gather the top. 15. Draw in the gathers until it fits snugly in the skirt bottom edge, and sew in place. 16. Turn right side out and viola! (hopefully) you have a dress ! I would love to know if anyone makes one! I love personal swaps PM me! What a fun dress. I like the boots with it, too. That is so gorgeous!!! And done without a pattern?? I'm all green with envy now!!! I'd love to know how you made it, I'm not quite up to the "able to wing a pattern" level yet. That is so cute and looks terrific on you with the boots.